Lots of people sending around this story of a secret cabal working to get the oil trade off the US Dollar. The story seems to have engendered a lot of comment on the web; the mysterious Web Bot Project has called for a financial crisis on Oct25 that could lead to a Dollar Crisis. It apparently tracks web trends and attempts to make predictions. I wouldn’t take this prediction to the bank but if it is widely crawling the web it may be showing the level of chatter on the demise of the Dollar is high. I find this waaaay overblown. The cabal is not so secret and the timeline is not so fast (2018, not tomorrow). Mish does a good job of showing the impotence of the effort. Foreign Policy writes a really good piece on how hard it would be to push the US out of its hegemony. The global reserve currency falls into the lap of the dominant power, and it does not leave easily. Even under the classic gold standard, it was the Bank of England that managed it, until 1914. After WWI the dominant power had moved to the US, and even then the global standard stayed in England. When the gold standard resumed in 1925, it was managed again by the Bank of England; but it had to create a bastardized standard, a gold exchange standard, where the Pound was backed by the US Dollar and the gold in the US. Only after WWII did the standard shift to the US, under Bretton Woods. Even when the US broke with the Bretton Woods gold exchange standard, the USD has continued to reign supreme against attempts to replace it as the reserve currency. Consider what is required to make the alternative work. The secret story says it will be based on gold. Now, a small amount of gold can go a long ways – global trade in 1913 was huge, and not matched until the mid-1990s. (I know that may seem hard to believe, but things fell a long ways down due to WWI and then the Great Depression). It was based on a 90-day instrument called a Real Bill, backed by gold held in the Bank of England. This Bills could be used to borrow against, and traded multiple times. A merchant in England contracted for cotton in the US to be shipped to a plant in China to be manufactured and shipped back to a store in London. The same, single Bill would be used at each step and often got traded or ‘discounted’ over 20 times. It all got cleared within 90 days and everyone paid off their debt – the many swaps down the chain simply paid off each other. (If you play with the math you can see it works.) As long as the balance of trade of the Bank of England was even, no net gold went in or out; it simply got shuffled in the vault from one bin to another. A small pile of gold could support a huge and growing trade system. Real Bills worked independently of such shenanigans. They were an emergent property of capitalism, arising early-on in the Italian city states, and hence were a very resilient system. Yet they died during WWI and have been largely lost to economic history. Instead we have commercial paper and other short-term instruments to finance trade, and are beholden to the whims and fancies of the banking sector. To remain in balance, the secret system would need to handle much more than just oil purchases; it would have to set up some form of clearinghouse with relatively stable trade flows across a wide variety of trade. This is very hard to pull off. Perhaps if the cabal thinks it through, they will establish in effect a clearinghouse for a new form of Real Bill, and use it for only half of what banks do: the commercial supply chain trade, not investment or venture finance. The central authority might be called a bank but would function more like a clearinghouse. As an aside, a lot of people do not appreciate the power of the Real Bill system. The Federal Reserve when created in 1913 was supposed to be a Real Bill clearinghouse. WWI threw a monkey wrench into that. The Austrians never got Real Bills, and have called for a 100% reserve banking system. This would be an utter disaster. Even the normally astute Mish went into a recent rant about fractional reserve banking being fraud. He got seriously slapped down by Karl Denninger’s rebuttal. A 100% reserve system would lack sufficient capital to grow; fractional reserves are a marvelous way to leverage a small amount of cash-on-hand. Anyone serious about changing the global financial system must separate the trade finance system of the Real Bill (or its modern equivalent of commercial paper. factoring and A/R finance) from the investment system of bank loans, private equity and venture capital. A banking or trade system backed by real stuff (houses, cars, goods-in-transit) does not need to have much in the way of reserves, since the financed properties themselves are collateral. While hard to pull off, it is not impossible for the USD to be replaced. Mish is too sanguine on this as well in his first article linked above, under-estimating the benefit for the US to power the oil trade. Other nations need to hold excessive Dollar reserves to finance the oil trade, and cannot easily convert out of it without impacting the value of the USD itself or of their own home currency. The US gets the benefit of seigniorage, and can run trade deficits much longer than possible under the classic gold standard. I have a bet that by 2020 the US Dollar will be replaced or supplemented by some form of gold-backed reserve. 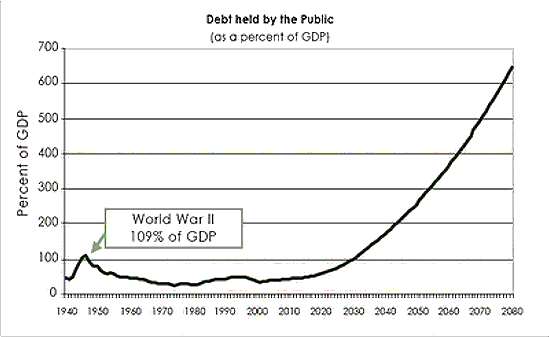 It would take a much more serious Dollar Crisis to get there than anything going on right now, but if you look at the long term chart of the US Debt (see chart from CBO) you will see it is complete fantasy that the US can continue with the current policies – and this chart is from late 2008; the picture is much worse today. At some point we will face a huge Day of Reckoning. My 2020 bet looked far off when I made it a couple of years ago .. we shall see if it is far enough out. The US can continue for a while with increasing deficits. 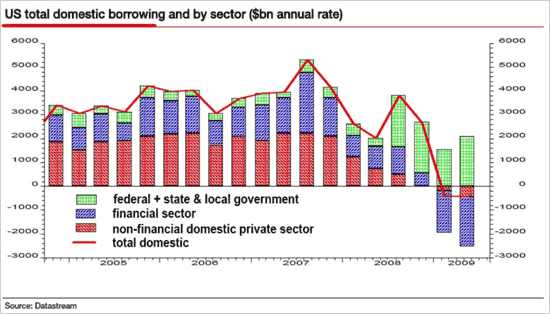 Right now we are deleveraging faster than the Federal government is borrowing; see second chart. This is why we are in a fundamentally deflationary environment. And why the Dollar Demise is not imminent, nor is a new gold standard somehow imposed from our trading partners. Mish’s argument is littered with inaccuracies as usual. Mish is an idiot. He has been in the deflation camp since even before oil reached $147. Even a stopped clock is right twice a day. First of all in order to even buy oil you do so via NY or London (I believe dubai which mainly clears through london and ny also has a small presence). You cannot simply park an oil tanker next to a pipeline and ask for a fill-up. Contracts have to be purchased through an underwriter and the soonest the obligation can be fulfilled is about 3-6 months, even then delivery is not guaranteed you must be insurance. During that time period you must hold a certain amount of dollars in your posession and build up a RESERVE of US dollars before you can have your product delivered. You cannot simply convert to dollars in a matter of minutes electronically and then purchase your crude oil immediately. For the US it does not matter theoretically how high the price of oil goes, whether it be $50, $70 or $200 a barrel. The US can simply enjoy the luxury of printing money to buy up that oil. Whereas if other countries printed money to solely buy a specific product priced in dollars, their currencies would depreciate in dollar terms first. It is a tremendous advantage for the US and the US dollar. If crude oil was no longer purchased in dollars then those massive reserves of US dollars to purchase crude would also disappear. Let me explain this article for you in lamens terms. No real wealth is created. It is the month of August; a resort town sits next to the shores of a lake. It is raining, and the little town looks totally deserted. It is tough times, everybody is in debt, and everybody lives on credit. Suddenly, a rich tourist comes to town. He enters the only hotel, lays a 100 dollar bill on the reception counter, and goes to inspect the rooms upstairs in order to pick one. So, what you’re saying is that everyone basically traded services rather than currency (which is basically just a representation of currency anyway)? Since everyone’s debt is payed off without any actual money being added to the scenario, that’s how I understand it.